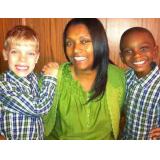 I am a single mother raising two boys, Josiah 5 and Thomas 7. Jesus opened heaven to Josiah. He walked with Jesus all around heaven. I wrote the story and had it published. Josiah was a four year old boy when he went to sleep June 9, 2012, and something amazing happened to him. He was awakened walking in heaven with Jesus. Jesus opened heaven and allowed Josiah to walk with him. He was taken on a tour of heaven by Jesus. This inspirational story is written by Josiah's mother, Tracy Summers, after Josiah spoke to her. On June 9, 2012, Josiah went to bed as he did each night. During this particular night, something spectacular and unusual happened to him. Jesus opened heaven to him. With amazement, Josiah walked around heaven with Jesus.